The Sussex Chamber of Commerce runs a monthly print and digital magazine called Business Edge, read by business leaders around the county. 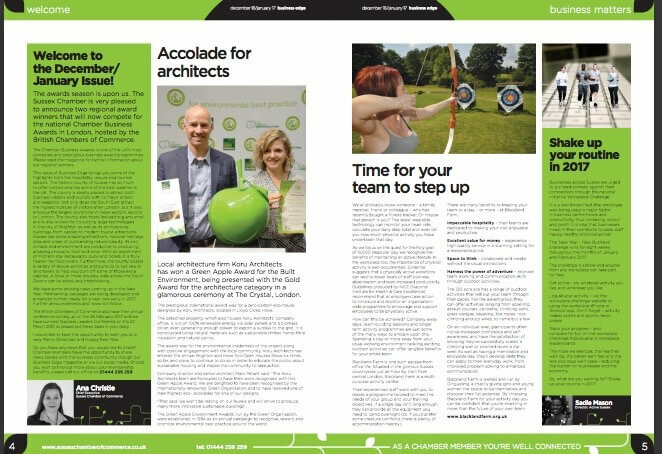 This month they decided to feature Koru Architects because of our achievement winning Gold in the international Green Apple Awards earlier this season. The prestigious award was won for the eco innovation and community outreach of our zero-carbon home and office at Lloyd Close, Hove. You can click here to read the digital version of the magazine issue. Our feature is on p4. Want to know more about the winning project? See the project page here and download our Zero-Carbon Home Case Study here.